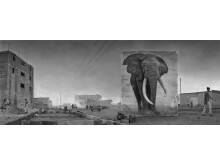 Fotografiska proudly present the new exhibition Inherit the Dust with Nick Brandt’s powerful and deeply disturbing series of epic panoramas: life sized portraits of animals placed and photographed at the sites where they used to roam. 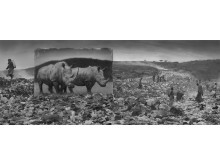 is exhibition demonstrates the terrible deterioration of the landscape and the absence of animals, because of the impact of man, in a heart breaking way. Our inheritance is transformed into dust, and what we are left with dissolves into nothingness... but there are alternatives. 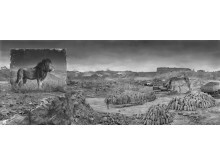 Since 2001, ne art photographer Nick Brandt has been documenting the vanishing natural world and animals of East Africa through his haunting, majestic portraits. Three years after the sombre conclusion of his African trilogy, On This Earth, A Shadow Falls Across the Ravaged Land, Brandt returned to East Africa to photograph the escalating devastation to the natural world of the continent. 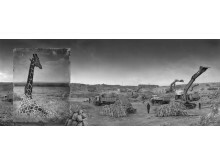 In this new series of epic panoramas, Brandt records the impact of man on places where animals used to roam, but no longer do. 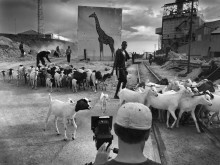 In each location, Brandt erects a life size panel of one of his animal portrait photographs, setting the panels within a world of explosive urban development, factories, wasteland and quarries. The people in the photographs go about their daily lives, oblivious to the presence of the panels and the animals within them, who are effectively now no more than ghosts in the landscape. But there is still a possibility to let the inheritance be more than dust. 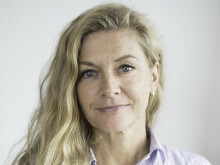 In 2010, Brandt co-founded the non-profit organization, Big Life Foundation, which helps protect over 800,000 hectares of East African ecosystem. Employing 350 local rangers and staff, Big Life has dramatically reduced the incidence of poaching in the region. »The economic benenefit of protecting the natural world is increasingly understood. Big Life’s ethos is working so far: if conservation supports the community, the community will support conservation. This is the hope for the future of Africa’s natural world,« says Brandt. 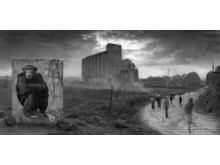 Photographic exhibitions are the foundation of Fotografiska, an international meeting place. Since our grand opening on May 20th in 2010, we have exhibited legends like Annie Leibovitz, David LaChapelle and Helmut Newton, and also introduced previously unexhibited photographers. More the 25 exhibitions every year guarantee new experiences of interesting photography for our guests. Photography is the technology to capture life. We support and provide life worth capturing.